The outdoor watch is a much-maligned beast. Often confused for a clunky plastic monster with some species of weather station attached, the genuine outdoor watch is nothing of the sort. Rugged maybe, but with a touch of class, and as reliable as, well, clockwork. The genuine article might be a specialist outdoors, but should also get admiring glances up the pub. Overall, it’s hard to not recommend the Garmin Fenix 3, which not only looks the part, but also provides a powerful array of outdoor tools to keep you safe. However, it is an all rounder, so we’ve picked out a few specialist watches for different outdoor pursuits to balance the books. There’s a huge range of outdoor watches on the market, so you’ll want to be clear from the outset just how much technology you really need. Too much and you’ll be out of battery within a couple of days, too little and your training program will suffer. For big expedition use, smartwatches and intensive GPS trackers are just too power-hungry, and you’ll want something solar powered or just very simple to keep working in all conditions. If you’re set on a tracking model, be clear whether you’ll just be tracking your progress for training, or using it as a navigational aid, as the two don’t always go hand in hand. Models that use GPS and other sensors (such as a barometer) often have better accuracy, but this may chew battery faster. On the bright side, the newest models tend to have a series of settings, so you can balance accuracy with battery life. Overall, the best outdoor watch for you depends on what you want to be doing, apart from the Fenix and Suunto 9, which can turn their hand to pretty much any outdoor challenge. Choose wisely, and get out there! The Garmin Fenix has evolved since its debut, and the result is a fearsome package of tech capabilities all wrapped up in a relatively compact smartwatch-style package. For starters there’s a full-fat GPS/GLONASS satellite navigation system here, backed up by 3-axis compass, altimeter and barometer for high-quality tracking and triangulation. Then you’ve got the wrist heart rate monitoring, combined with strong fitness training features including running dynamics stride length, vertical ratio and VO2 max, and this is really an all-rounder for outdoors folk of all stripes. Sure, the colour screen and GPS tracking will burn a full charge in under 16 hours, but that’s a pretty decent mountain ultra-marathon, and you can tone the accuracy down to hit 40 hours in UltraTrac battery saver mode, which is a pretty big day out. If you’re worried about delicate outdoor watches falling apart on you, then the Nixon Mission SS is the beast for you. A stainless 48 mm bezel and 23mm solid stainless steel bracelet set the tone for a seriously chunky Google Wear smartwatch, fronted by Gorilla glass. The surfing expertise comes courtesy of a sync with Surfine, the world’s largest source for surf conditions reporting, and Snocountry, a mountain conditions alert system. Also packing in GPS, thermometer, altimeter, barometer, the Mission SS has plenty of onboard intelligence too, as well as Google Wear ingenuity when synced to your smartphone, such as remote camera operation, maps, etc. The Shearwater Teric is a little bit special in the world of dive watches, and has already forced bigger brands to follow suit. Essentially it’s a diving smartwatch, which might sound obvious, but when you’re 50m deep on trimix a crash and reboot to factory settings could be somewhat harrowing. Above water you’ve got a sizeable AMOLED screen, chunky stainless bezel and sapphire lens, with a variety of different watch faces and strap colours to choose from. Underwater you have wireless tank pressure integration, configurable display, as well as full trimix, nitrox, air and gauge settings. In short, the Teric is a highly potent dive computer, as well as being an everyday watch. Unfortunately, the only question right now is whether you can find one to buy, as they’re in very short supply. 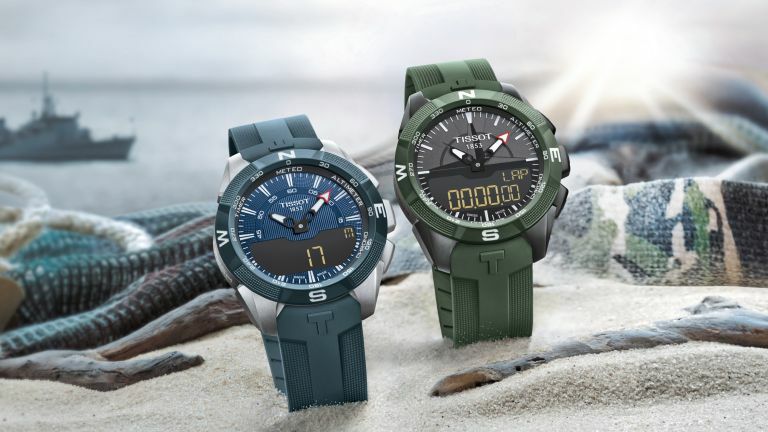 The snappily-named Tissot T-Touch Solar Expert ticks a lot of expedition boxes. Robustly built from titanium, the touchscreen face also conceals a solar panel, so there’s no danger of a dead battery in the Karakoram. The featureset is strong too, with 25 features including weather forecasting, altimeter, second time zone and a compass built in. Although the latter is probably best saved for real emergencies, the barometer/altimeter function could come in very handy for acclimatising hikes. With a range of strap materials on offer to suit all preferences, this is stylish enough for town, but also tough enough for those mountain excursions too. When you want fitness tracking whenever, wherever, then the Suunto 9 Baro has a lot to say for itself. The ‘baro’ in the name refers to an additional barometer sensor over the stock model, which not only provides weather information, but also makes that the GPS tracking much more accurate on long ascents. With 80 sports to choose from there’s no limit to the use you’ll get out of the Suunto, and the ability to sync and upload routes and PBs to your Movescount account is handy for comparisons and sharing with friends. Wrist heart rate monitoring is built in, as are a myriad of fitness stats, and there’s even sleep tracking too. This watch has all the bells and whistles you could want for, and even has a decent battery life with them all switched on. Sometimes you want simplicity, you crave form, function but no distractions, and this is when the Victorinox I.N.O.X makes complete sense. A simple exterior and basic quartz movement provide little bling or technical wizardry, but the case claims to be the only Swiss watch to withstand 130 extreme endurance homologation tests, which is no idle boast. The strap is woven from survival favourite paracord, high breaking strain cord that can be used to construct all manner of useful shelter-related items, and also included is a removable compass bumper for protection against scratches, and easier navigation. Survivalist simplicity doesn’t come looking better than this. Ready to start your next adventure? Check out our pick of the best action cameras to document your travels.